This year’s Bollington Walking Festival has been a great success, and was supported by local MP, David Rutley. Running from 23rd September to 1st October, and organised by Destination Bollington Forum, including Walkers are Welcome and Bollington Town Council, this was the 8th Bollington Walking Festival, with more walking groups taking part in it than ever before. The Festival also featured other events at local venues, including quiz nights, folk music recitals, and a comedy performance, helping to support local businesses and the visitor economy in Bollington. During the Festival, David was pleased to take part in one of the over forty walks on offer. 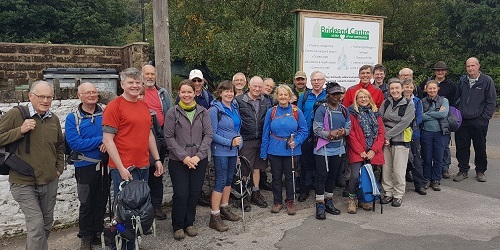 Alongside members from the East Cheshire Ramblers, as well as local residents and walkers from further afield, he took part in a walk from Bollington via Pym Chair and Shining Tor – the highest point in Cheshire – and into Thursbitch Valley, also known as the ‘Valley of the Demon’. There the group heard a brief talk on the history of the area, including its place in local folklore as site of the unsolved death of a local salt jagger, John Turner, in 1733. A longstanding partner of the Festival is leading Bollington charity the Bridgend Centre. Located on Palmerstone Street, it acts as the main information point for the Walking Festival, as well as being a great place to pick up refreshments ahead of or at the end of a walk.